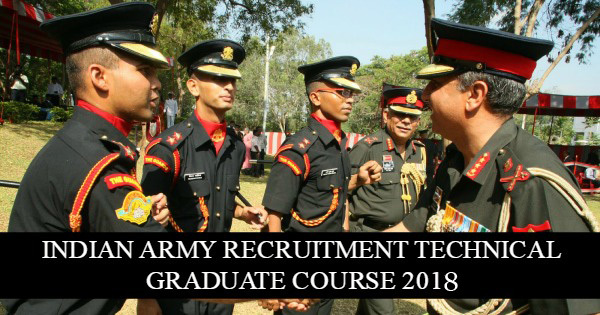 Indian Army announces recruitment for Technical Graduate Course (TGC) – 127th. Applications are invited from unmarried Male Engineering Graduates for 127th Technical Graduates Course (commencing in Jul 2018 at Indian Military Academy (IMA), Dehradun) for permanent commission in the Indian Army. Total 40 vacancies are open. They will cover the following recruitments. 10 Posts for Civil Eng, Civil Eng, (Structural Eng) Structural Engineer, for Architecture Engineer 1 post, Mechanical [Mechanical Engineer, Mechanical (Mechatronics) Engineer Mechanical & Automation Engineer 4 Posts, Electrical/Electrical & Electronics 5 Posts, Computer Sc & Engineer/Computer Technology/InfoTech/M.Sc. (Computer Sc)6 Posts, Electronics & Telecom/Electronics & Communication/Satellite Communication 7 posts, Posts Electronics 2, Metallurgical 2 Posts, Electronics & Instrumentation 02, Posts Micro Electronics & Microwave 1 Post. Online Application starts from 24th October 2017 (at 10.00 AM). Last Date for Online Application is 22nd November 2017 (till 12.00 PM). Technical Graduates Course is commencing in July 2018.